Research Vessel Petrel discover WWII aircraft carrier USS Wasp only month after discovering another World War II-era shipwreck, the USS Hornet, which sank not far away, off the Solomon Islands. The Wasp played a pivotal role on multiple fronts during WWII; providing defensive fighter cover for American army planes landing in Iceland, aiding missions to Malta; a location being hit daily by German and Italian planes. On her final voyage, Wasp was under way in the Coral Sea, escorting transports carrying the Seventh Marine Regiment to reinforce U.S. troops on Guadalcanal, where Japanese forces were pushing back against American efforts to seize the Solomon Islands. On Tuesday, 15 September 1942, US carriers Wasp and Hornet and battleship North Carolina with 10 other warships were escorting the transports carrying the 7th Marine Regiment to Guadalcanal, when USS Wasp was hit by four Japanese torpedoes from the Japanese submarine I-19. 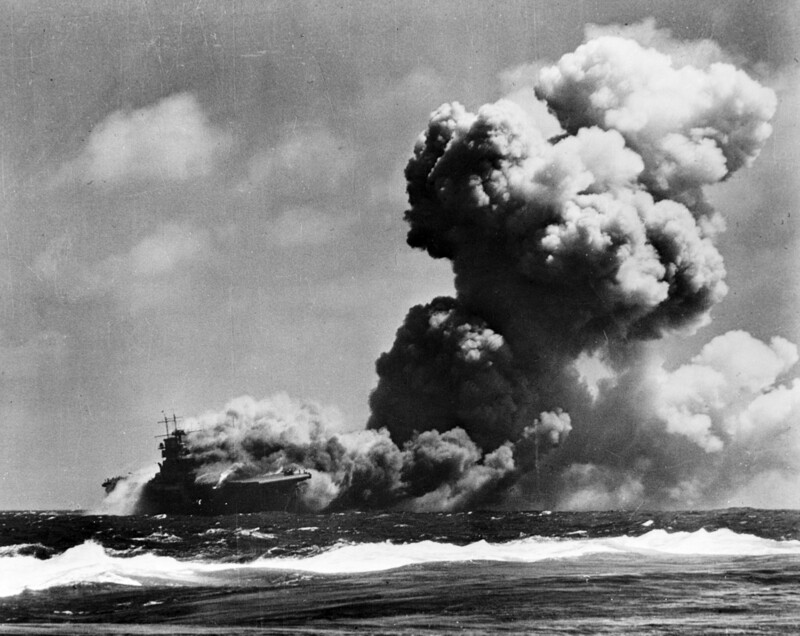 Explosions ripped through the flight deck forward as her ammunition magazines and aviation gas stores caught fire. Only when assured the Wasp had been successfully abandoned did Capt. Forrest P. Sherman leave the burning ship. USS Wasp remained crippled but afloat, and the destroyer USS Lansdowne received the order to scuttle her. After three torpedo hits from Lansdowne, she went below at 2100 hours. All but one of her 26 airborne aircraft made a safe trip to carrier Hornet nearby before Wasp sank, but 45 aircraft went down with the ship. One hundred and seventy six men perished in the attack of the 2,248 aboard. R/V Petrel Discovers Final Resting Place of USS Wasp.